NOTE: I am searching for anyone who might be descended from or related to my Olar, Paskar, Toderiuc, and Ciopei ancestors. I also am searching for members of the Giber/Krusniski family of Baudette, Minnesota. In February 2008, I had the joy of making contact with the descendants of my grandfather's older brother Mihai Olar. If you are a relative, or think you might be, I encourage you to please contact me. See also our Family Search pages with family photographs hosted by Maritza Hreniuc in French, English, and Romanian. Thanks! In researching my father's genealogy, I have received invaluable assistance from my parents and aunts and uncles and cousins. I must give special mention to my cousin Greg Budovec, for whose generosity in sharing old family photos and mementos I am very grateful. I have also greatly benefited from the kindness of my distant cousins Mariana Zotic and Vitalii Eremeiko. Last but not least, I also have benefited from the help of The Bukovina Society of the Americas. Their website is a storehouse of very helpful information, and I have relied on some of the Society's articles to help write this account of the Olar genealogy. MY FATHER'S parents were ethnic Romanians from Bucovina (or Bukovina), a territory that was a duchy in the Austro-Hungarian Empire at the time of my grandparents' birth. In fact, sometimes my grandfather would say he was "Austrian" when asked what his national origin was. Other times he described himself as "a Romanian of Rusyn descent," by which he was referring to his maternal Ukrainian ancestry. Most of Bucovina's inhabitants were, and still are, Ukrainians (Ruthenians or Rusyn -- pronounced similarly to, but not to be confused with, "Russian") and Romanians, but it also has had thriving populations of different ethnic groups such as Hungarians, Poles, Germans, Serbs, Croats, Slovaks, Russians, Jews, and even Armenians. My grandfather learned to speak several languages with varying degrees of fluency, simply so he could talk with his neighbors. Genetic testing has confirmed what we already knew of my father's ancestry through tradition and genealogical research. From testing my father's male (Y) chromosome, we have found that the Olar family's paternal haplogroup is J2 (J-M172), a large genetic family historically found throughout the Near East, Southern Europe, and Northern Africa, while his matrilineage through the Pascar and Ciopei families belongs to the HV9 haplogroup, a female lineage historically found in Italy, Bohemia, Poland, Russia, Scandinavia, and Britain. Tests have found that 45.8% of my father's autosomal DNA is Southern European, which includes Romanian and other Balkan ethnicities, and 36.8% of his autosomal DNA is Eastern European, which includes Ukrainian or Ruthenian ethnicities. My father's DNA test has identified numerous distant cousins of his who are of known Ukrainian and/or Romanian descent. The history of Romania begins with the Dacians, a people who were closely related to the Getae and Thracians, a group of tribes who anciently dwelled in lands that would become Bulgaria, Romania, and Ukraine. The Thracians and Getae were related peoples and spoke similar languages, and classical Roman and Greek writers used "Getae" and "Daci" interchangeably. If the ancient Jewish historian Josephus is to be trusted, then the earliest historical reference to the Thracians would be in Gen. 10:2 (cf. I Chron. 1:5), where Tiras is listed as the youngest son of Japheth, son of Noah. "Thiras also called those whom he ruled over, Thirasians, but the Greeks changed the name into Thracians," Josephus writes. Medieval legends refer to Geta and Dacus, eponymous ancestors of the Getae and the Dacians who are said to have settled in Eastern Europe after Noah's Flood. Be that as it may, the Getae first appear in history in the 400s B.C., in the writings of the Greek historian Herodotus, who calls them a Thracian people. Alexander the Great campaigned against them on the lower Danube in 335 B.C. "Dacians" by name first appear in the historical record during the 300s B.C., when Dacian slaves began to be sold in the Athenian slave market. The Roman writers Trogus Pompeius and Justin mention that in the early 100s B.C. (prior to 168 B.C.) there was a Dacian kingdom in Transylvania ruled by a king named Rubobostes. The Dacian kingdom attained its greatest extent and power under Burebista (82-44 B.C.). However, the pivotal event of Dacian history was the Roman conquest under Emperor Trajan in A.D. 106. Trajan defeated the Dacian king Decebalus, who fled and committed suicide rather than submit to being paraded during Trajan's Triumph in Rome. After the Roman conquest many Dacians fled north beyond the bounds of the Roman Empire. To replace them, Trajan brought in colonists from all over the Roman Empire, especially from Illyria (modern Croatia, Bosnia, and Serbia). Emperor Aurelian was forced to abandon the province of Dacia to the Goths in A.D. 271. Even so, Roman cultural influence in Dacia would prove to be enduring, as seen in the survival of the Latin language which evolved into the Romanian language. The Romanians are very proud of their Roman heritage. In subsequent centuries, the Romanised Dacians would be overrun by, and would sometimes absorb or mix with, several waves of invaders, starting with the German Goths and Gepidae. It is notable that many ancient and medieval writers, including the Gothic historian Jordanes in A.D. 551, identified the Goths with the Getae (Jordanes' Gothic history is even called the Getica), but that identification seems most doubtful, since the Getae spoke a Thracian dialect while Gothic was a Germanic tongue. The "Getae = Gothi" tradition could indicate, however, that the Goths and Dacians intermixed to a degree that the Goths could comfortably appropriate Getic history as part of their own heritage. The Goths and their kin, the Gepidae, did not remain in Dacia, but were pushed into Thrace (Bulgaria) and Pannonia (Hungary) by the Asiatic Huns, who moved into Dacia in the 400s A.D. After the Huns came the Slavs and then the Avars. The Bulgars arrived in the latter half of the 600s A.D., followed by the Hungars (Magyars) at the end of the 800s A.D. Later there was a brief invasion by Petchenegs and Cumans. Finally came the terrifying and destructive Tatar-Mongol invasion in the 1200s A.D. By the Middle Ages, the descendants of the Romanised Dacians had come to be known as Vlachs or Wallachians, a name that is probably related to the Germanic words for "Roman," Welsch, Wealh, or Valar. Culturally they were very much like their Slavic kinsfolk and neighbors, using the Cyrillic script but speaking a Romance tongue rather than a Slavic tongue. Also, like many Slavic peoples, they adhered to Eastern Christian rites. From the time of the Great Schism in the East in 1054 A.D., most Romanians have been Eastern Orthodox Christians. My grandparents were both baptised in the Romanian Orthodox Church. The unbroken recorded history of the Romanian people does not commence until after the Tatar-Mongol invasion, which obliterated Eastern European historical records. Around 1300 A.D., two Romanian principalities were founded: Wallachia or Muntenia (later to become southern Romania) and Moldavia (later to become northeastern Romania). During the 1500s, both principalities were brought into subjection by the Ottoman Turks, who governed Wallachia and Moldavia (called Efflak and Bogdan in Turkish) through Romanian and Greek Phanariot princes and nobles who ruled at the pleasure of the Muslim Sultan. The Ottoman Empire went into a decline in the 1700s, and the Russian Empire wielded its growing power to force the Turks to grant more and more concessions to the Romanians. In the early 1800s, Moldavia and Wallachia were semi-independent but still nominally under Turkish suzerainty. In 1859 the principalities of Wallachia and Moldavia elected a single prince, Alexandru Ion Cuza, and in 1862 the two principalities formally united. In 1866, Cuza was compelled to abdicate, and a German prince, Karl Eitel Friedrich von Hohenzollern-Sigmaringen, was elected as Carol I. The principality of Romania declared its independence from the Ottoman Empire on 22 May 1877. The principality became a kingdom in 1881, and Carol was crowned king on March 26 of that year. At the end of World War I in 1918, the territories of Transylvania, Bucovina (Bukovina), and Basarabia (Bessarabia), lands that had long had significant Romanian populations, were added to the kingdom. During World War II, Romania sided with the Nazis and Fascists. Like many European nations, the Romanian people had long been plagued by anti-Semitism, and many (though by no means all) Romanians enthusiastically participated in the Holocaust. Afterwards, the Jewish population of Romania was all but wiped out. In my grandfather's village of Tereblecea, a small but thriving Jewish community was blotted out completely, though that was due not to Nazi activity but to the general desolation visited upon all the peoples of northern Bucovina by the Russian Communists and their collaborators following Russia's criminal occupation of northern Bucovina in 1940. In 1944, King Mihai (Michael), great-greatnephew of King Carol I, led a coup d'etat that ended Romania's alliance with and subservience to Nazi Germany. Nevertheless, after the war the Russian Communist Empire annexed the northern half of Bucovina as well as Basarabia, which they renamed Moldova (now an independent state). Sadly, Romania escaped from dictatorship and the Nazi influence only to fall under the dire curse of Communism. In 1947, King Mihai was forced to abdicate and a Communist tyranny was established. Communism finally was overthrown late in 1989 and the tyrant Nicolae Ceausescu was mercilessly executed following a bloody and painful revolution. Since then, Romania has slowly begun to heal of the severe wounds it suffered during the 20th century, but deep social and cultural scars still remain. After the end of Communism, King Mihai resided part of the time in Romania until his death in 2017, but there is no strong movement to reestablish the monarchy. Mihai had five daughters, but no sons, and under the defunct Romanian Constitution of 1923, Mihai's lawful successor is the senior male representative of the Princely House of Hohenzollern-Sigmaringen (currently Prince Karl Friedrich von Hohenzollern, born 1952). Nevertheless, in 1997 King Mihai designated his oldest daughter Princess Margarita as heir to the headship of the Romanian royal family after his death. The monarchy would first have to be restored and the old 1923 succession law altered to allow Margarita to succeed as Queen of Romania. Additional information on Romania's history is found in the Catholic Encyclopedia's article "Rumania." BUCOVINA, which is Ukrainian for "Land of the Beech Trees," was the northern tip of Moldavia and was bordered on the west by the Carpathian mountains. It no longer exists as a distinct administrative territory, however. At the end of World War I in 1918, the Austro-Hungarian Empire was violently dismembered, and following that chaos Bucovina was assigned to Romania, which then was ruled by King Ferdinand, nephew of King Carol I. Then during World War II, the northern half of Bucovina was invaded and forcibly annexed by the Russian Communist Empire through a pact between the Communists and Nazis. After the war, the Allies acquiesced to the annexation, partly to punish Romania for its war-time alliance with the Nazis. Today the northern half of Bucovina, which seems to have had a majority Ukrainian population from time out of mind, forms the Chernivetska oblast in an independent Ukraine, whereas the southern half, which also seems to have had a majority Romanian population from time out of mind, now forms the Romanian county of Suceava. 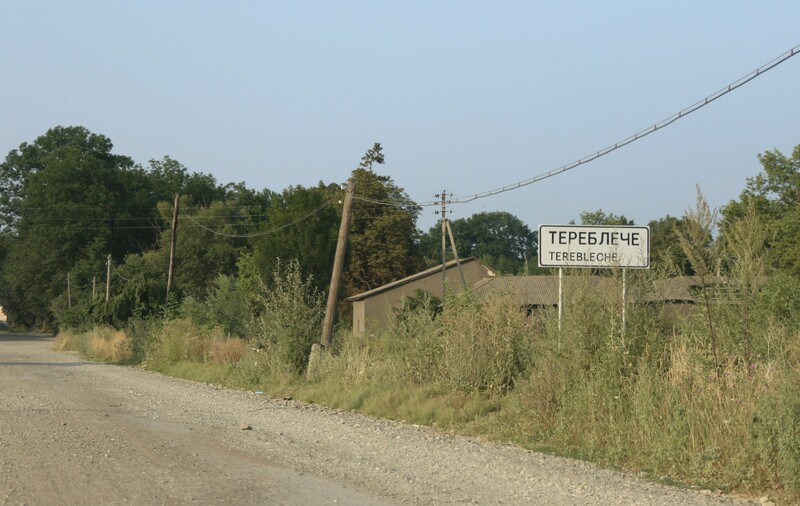 The village where my grandparents were born, Tereblecea (German Tereblestie, Ukrainian Terebleche or Terebleshti, sometimes known as Porubne, the name of the Ukrainian-Romanian border crossing nearby), is now located a very short distance north of the border of Romania and Ukraine. Reaching back to the Middle Ages, the area that would become Bucovina was the heart and core of the Romanian Principality of Moldavia, which was founded about 1300 A.D. by a prince ("voivode") named Dragos. Moldavia's princes had their seat in the city of Suceava, located in what would become southern Bucovina. The principality first achieved the status of an independent state around 1359 A.D. under Bogdan I of Guhnea. 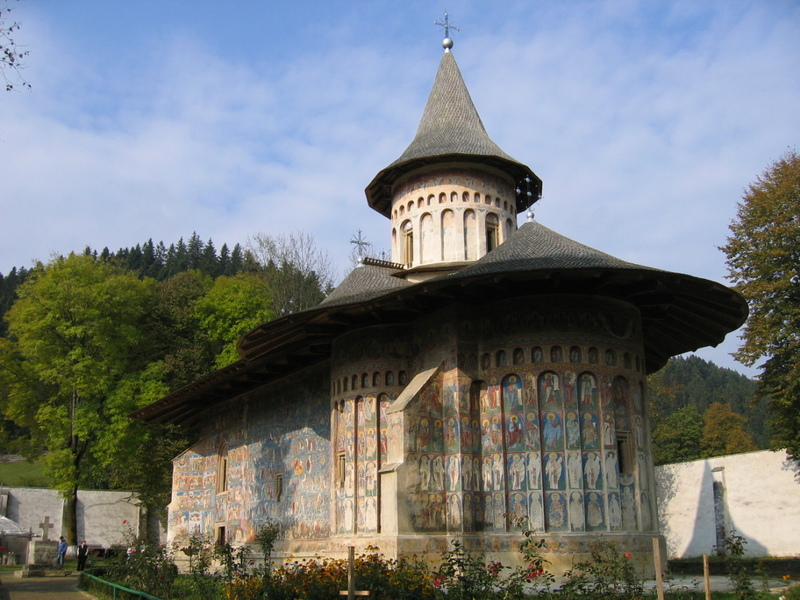 During the reigns of Stefan III Musati, known as Stefan the Great (1457-1504), and of Stefan's illegitimate son Petru IV Musati, known as Petru Rares (died 1546), the famous Painted Monasteries of northern Romania were constructed. 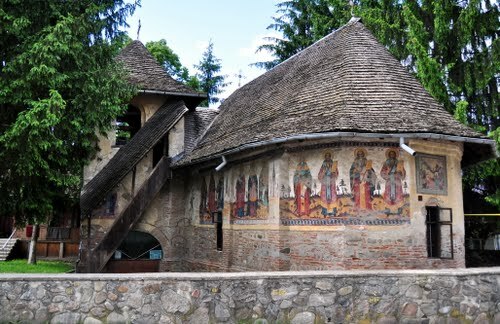 Shown here are images of Voroneţ Monastery in Gura Humorului, Romania, built in 1488 by Stefan the Great, Prince of Moldavia, in thanksgiving that God had granted an astounding victory against the Muslim Turks at the Battle of Vaslui, known as "the greatest [military victory] ever secured by the Cross against Islam." 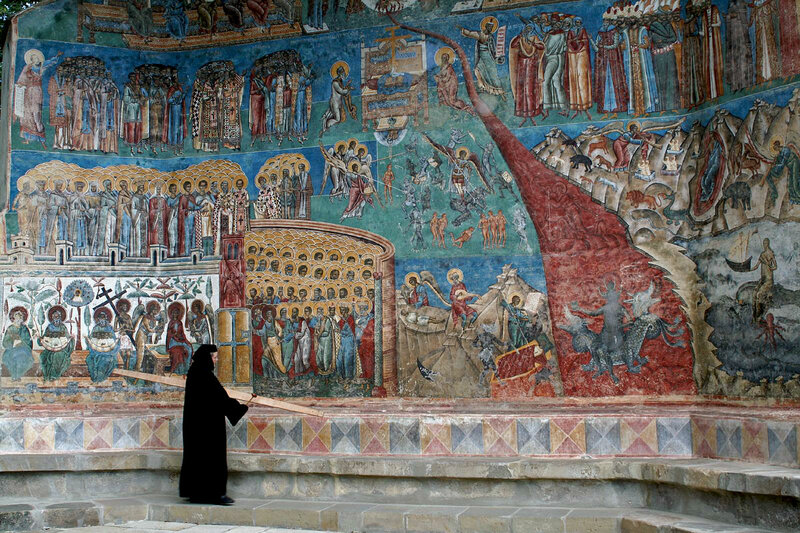 Voroneţ Monastery is one of the most stunningly beautiful churches on earth, and the monastery's frescoes, including the exterior paintings which were done in 1547, are internationally renowned artistic treasures. The Ottoman Turks, as part of their plans to conquer all of Europe and eventually convert its inhabitants to Islam, repeatedly attacked the Romanian principalities of Wallachia and Moldavia starting in the latter 1300s. Stefan the Great was a noble and tireless warrior, devoting his reign to the defense of Europe from the Turks, but after his death, his son Bogdan III was forced in 1513 to pay annual tribute to the Muslim Sultan. Moldavia decisively succumbed to the Muslim armies in 1538. From that time the region stagnated and decayed as it endured Ottoman rule, but in 1769 the Russians began to occupy Bucovina during a war between the Russian and Ottoman empires. Just a few years later, in 1774, the Austrian Empire drove out the Russians and occupied Bucovina, which was formally ceded to Austria by the Ottoman Empire through the Treaty of Constantinople in 1775, during the reign of the Habsburg Empress Maria Theresa. When Austria acquired Bucovina, the region was sparsely populated. A census of 1775 counted only about 75,000 souls in all of Bucovina. A few years later, Karl Baron von Enzenberg, military governor of Bucovina, conducted the first formal census of Bucovina, and found a little more than 100,000 souls, not even six persons per square mile. The largest settlement was Czernowitz (Ukrainian Chernivtsi, Romanian Cernauţi), which had only 1,390 souls dwelling in about 200 mud huts. Most of the land was owned by the monasteries or by nobility, and the inhabitants were almost entirely shepherds and peasants, many of whom tended to move in and out of Bucovina seasonally. However, even in 1778 Bucovina was already a multi-ethnic land. In conducting his census, Baron von Enzenberg encountered Moldavian Romanians, Jews, Gypsies, Armenians, Hungarians, and Ruthenians. Since Bucovina had such a small population and had suffered such decay and neglect under Muslim rule, the Austrian Emperor began to encourage immigration to Bucovina. The population quickly began to increase and to grow even more diverse, roads were built, and Czernowitz, the capital of the duchy, became a respectable city with its own university. By the time my grandparents left Bucovina, the population of the Duchy of Bucovina was more than 800,000 souls. From 1786 to 1849, Bucovina was administered as a district of the province of Galicia. In 1849, Bucovina became a duchy and a separate crown land. It would remain such until, as mentioned above, it was annexed by Romania in 1918 in accordance with the Treaty of St. Germain. Northern Bucovina was occupied by the Russian Communist Empire beginning in 1940 and was permanently severed from Romania in 1945. Additional information on Bucovina's history is found at the website of the Bukovina Society of the Americas, here and here. TEREBLECEA today is a small town in Ukraine with a population of about 8,000. It is located on the plain near the Siret River, just a very short distance north of the Romanian border, and although Tereblecea is in Ukraine, many if not most of the inhabitants are still ethnic Romanians. Tereblecea was the birthplace of publisher Filimon Rusu (born 25 Dec. 1880) and the writer George Nimigeanu (born 24 May 1909), as well as George Nimigeanu's cousin Dumitru Nimigeanu, author of a personal memoir of survival and escape from Communist tyranny, Hell Moved Its Border. In my grandparents' youth (that is, more than 100 years ago) Tereblecea was only a village -- or rather, it was two villages. The original village of Tereblecea was a small settlement of Romanians, but in 1789, during the time of Austrian rule, Germans began to move to Tereblecea, or "Tereblestie" as it was called in German. The new, German area of the village was known as Deutsch-Tereblestie, to distinguish it from the original Romanian Tereblecea (Romanisch-Tereblestie or Rumanisch-Tereblestie), part of which was known as Prisaca ("Apiary," place of bee hives). These scenes from Tereblecea were photographed in July 2016 by Adrian Zotic. The recorded history of Tereblecea, however, begins long before that, as we find in Ion Cretu's 333-page history, Tereblecea: un sat la margine de tara ("Tereblecea: A Village on the Border of the Country"), published in 2010, and in a three-part overview of Tereblecea's history included in Ion Dragusanul's three-volume Povestea asezarilor bucovinene ("The Story of the Bucovinian Settlements"), which was published from 2010 to 2012. Dragusanul's summarised account of Tereblecea's history, which probably relies in large part on Cretu's book, is available at the website of Monitorul de Suceava ("The Suceava Monitor"), a local journal published in the city of Suceava, capital of Suceava County (the southern half of Bucovina). The three parts of Dragusanul's history are found here, here, and here. Dragusanul's account of the history of Tereblecea has been rendered into English with the help of Daniel Florin Predoiu and Adrian Marius Zotic, for whose assistance I am very grateful. The following review of Tereblecea's history is based on Dragusanul's account, supplemented by other sources. It is unknown exactly how long the site of Tereblecea has known human habitation, but the village itself has existed since the Middle Ages, when it was known as "Telibecinţii pe Siret" (Telibecinţii on Siret). The first historical reference to Tereblecea is found in a document dated 11 March 1446, when Telibecinţii on Siret was granted by Stefan II, Prince of Moldavia (1434-1447), son of Alexandru the Good, to the monastery of Neamţ, with the provision of special tax exemptions for the villagers. The following year, on 22 Aug. 1447, the villagers' privileges were reaffirmed with the addition of exemptions. Dragusanul writes, "The same reaffirmation was obtained for the monks of Neamţ in 1454, the donation being confirmed on 6 June 1446, when the village church was given to the monastery of Neamţ, and on 8 Dec. 1454, but in the reign of Stefan the Great (1 April 1470)." It is possible that the original founding of Tereblecea resulted from the devastating Tatar-Mongol invasions of 1241 A.D., as Wilhelm Messner, a former schoolteacher from Deutsch-Tereblestie, explains in his 1985 book Die schw�bisch-pf�lzische Bauernsiedlung Deutsch-Tereblestie von ihrer Gr�ndung bis zur Umsiedlung 1789-1940 ("The Swabian-Palatinate Farm Settlement German-Tereblecea from its Establishment until the Resettlement, 1789-1940"). Although Messner's book focuses on Deutsch-Tereblestie, it also is valuable for what it says about the history and culture of the Romanians of Tereblecea. The following passages from Messner's book were translated by Irmgard Hein Ellingson, who shared her translation with me in two emails from Dec. 2001 and Feb. 2002. On this question of the meaning and etymology of "Tereblecea" or "Telebecinţi," Dragusanul comments in passing that "in Turkish and Tatar, 'telebleci' means 'Tatars'." 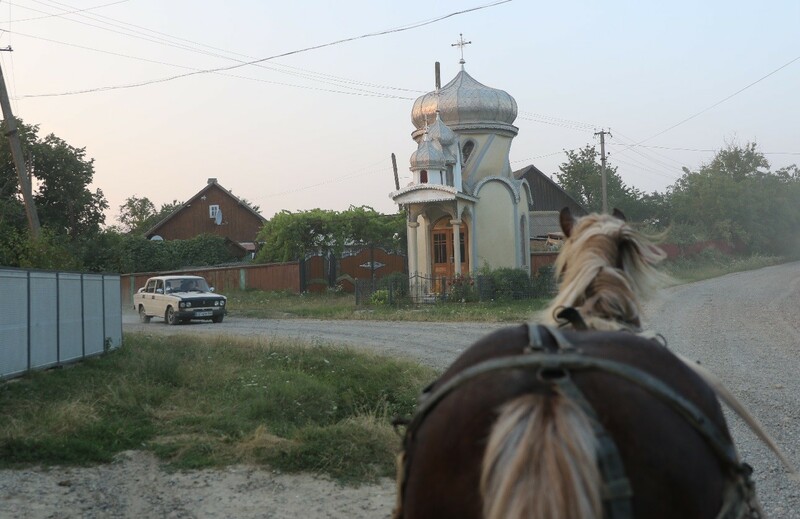 If it is true that Tereblecea started out as a Tatar settlement, then it is not impossible that my grandfather's village is about as old as the medieval principality of Moldavia itself. On the other hand, the placename could be a late survival or memory of the medieval Tatar invasion, while the settlement itself either predated the Tatar invasion or else was founded well after the coming of the Tatars. Continuing with Dragusanul's account, he notes that in a document of 15 March 1490, we find enumerated among the fortified churches of Stefan the Great in the Diocese of Rădăuţi a "14th church, with priest, the Telebecinţi." The next historical reference to Tereblecea is in a document dated 2 Feb. 1508 confirming the dominion of Neamţul Monastery over "the village of Telebecinţe on Siret and the mills, and another village, Tristianeţ near the beech wood (sub bucovină)." This document also mentions that a certain "son of B�rlici" had owned Tereblecea before it was granted to the monastery of Neamţ. Shown is Neamţ Monastery in Neamţ County, Romania. 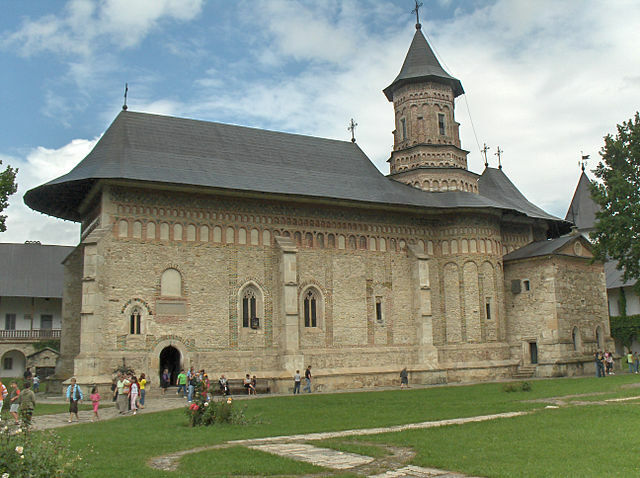 Construction on the monastery was begun by Stefan the Great, Prince of Moldavia, and was completed in 1497. Tereblecea formerly was a feudal possession of Neamţ Monastery. 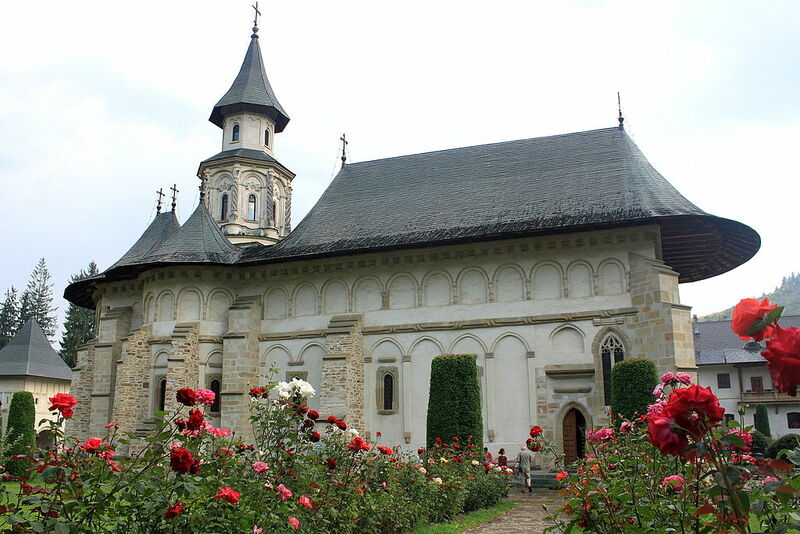 Tereblecea remained a possesion of Neamţul Monastery until 1 Sept. 1668, when Abbot Teofil (Theophilus) of Neamţ sold "Tereblecea, with the millwork on the Siret" to the treasurer Gheorghe Ursachi for 280 Dutch guilders, 10 oxen and one horse. Dragusanul notes that Tereblecea was depopulated from the date of sale until 1670, but he does not explain why the inhabitants of the village had abandoned it during those years. The scourge of war came to Tereblecea in the early 1700s, as is shown by a comment from Grigorie Nandris, a member of the Romanian Parliament prior to 1940, in his foreword to Dumitru Nimigeanu's book, Hell Moved Its Border. Nandris says Tereblecea "has twelve times experienced the horror of a Russian military occupation since 1711, when Peter the Great, in his desire to secure for his country 'a window on the world,' was defeated in his disastrous campaign on the river Pruth." During these decades of the late 1600s and early 1700s, the village apparently remained under secular ownership until 14 May 1724, when Tereblecea's feudal owner Ioan Balş, son-in-law of Gheorghe Ursachi, sold it for 300 Dutch guilders to Calistru, Bishop of Rădăuţi, who bought Tereblecea with the intention of granting it to Putna Monastery. About 24 years after that, a civil disturbance arose in Tereblecea, when a certain individual named Panţirii of Tereblecea refused to hand over the tithes that Tereblecea owed to Putna Monastery. In response, on 15 Jan. 1748 Grigorie II Ghica, Prince of Moldavia, ordered the chief magistrate of Ropcea to collect the tithes by force. Putna Monastery in Suceava County, Romania, built in 1466 by Stefan the Great, Prince of Moldavia, in thanksgiving to God for His having granted him victory in battle against the infidel Turks at Kilia. The monastery also houses the tombs of Prince Stephen and members of his family. "On 1 Nov. 1761, because the abbot of Putna Monastery complained that the village boundaries were not well defined, a new delimitation was conducted and the Tereblecea village boundaries were marked as follows: the River Siret, the Greci estate near Siret, the village B�rlinţi of Stefan Starcea, the clearings of Hajdău, the creek of Cotov�ţ, the main road, the road that goes to Panţ�ri, F�nt�na Albă, the borders of the village of Stăneşti, the borders of the village of Sinăuţi, and the borders of the village of Greci." It was around this time that the first censuses of the region of Bucovina were conducted. According to Dragusanul, the Census of Rumeanţev took place in 1772-1773. At that time, Tereblecea had two districts, known as Tereblecea-Ungureni, in the vicinity of Berhomete, inhabited by Romanians who had immigrated from Transylvania in Hungary, and Tereblecea-Moldoveni, inhabited by Romanians native to Moldavia. The census counted 31 houses in Tereblecea-Ungureni, in which lived one poor woman and 30 tribute-payers, while in Tereblecea-Moldoveni were five houses, in which lived five tribute-payers. Beginning in the 1770s, as Dragusanul explains, the population of Tereblecea began a marked and sustained increase, aided in large part by the end of the military action in the general area that had taken place during hostilities between the Russian and Ottoman empires, and the acquisition of Bucovina by the Austrian Empire in 1774-1775. In 1774, 46 families lived in Tereblecea, and the following year there were 51 peasants and one priest living in the village. By 1784, however, the village's population had jumped to 158 families as a result of an influx of Transylvanian Romanians from Rebra Mara (today in Bistrita-Nasad County, Romania) and Sfantu-Gheorghe (today in Covasna County, Romania). Austrian census records from the 1780s provide the names of these immigrants and the dates of their arrival in Tereblecea, and most of their surnames subsequently appear with great frequency in the village's parish registers throughout the 1800s and early 1900s. At the same time that the ethnic Romanian population of Tereblecea was increasing, German colonists also were beginning to arrive. "In 1787 and in 1789, the first German colonists established themselves in Tereblecea, farmers who had come from the Rhineland, from Bavaria, and from Baden-W�rttemberg," Dragusanul says. The German newcomers were predominantly Lutheran Protestants, while some were Catholics. As mentioned above, the influx of German immigrants resulted in the creation of a new, German area of the village known as Deutsch-Tereblestie, which was distinct from the original Romanian Tereblecea (Romanisch-Tereblestie or Rumanisch-Tereblestie), part of which was known as Prisaca ("Apiary," place of bee hives). The ethnic Romanians and the Ruthenians (Rusyn) of Tereblecea, of course, were Orthodox. Besides the German arrivals in Tereblecea, says Dragusanul, "In the summer of the year 1803, 11 families of Slovak colonists, numbering 67 souls, settled in Tereblecea, another 14 Slovak families arriving in 1814, but since 1817 many of them will scatter to the neighbouring villages, with only 18 Slovak families remaining in Tereblecea." The Slovak immigrants were Catholics. Since the majority of Tereblecea's inhabitants were Orthodox, the chief church in the village was the Orthodox church. Dragusanul notes that in 1843, the Orthodox church had 1,421 parishioners, whose pastor was Father Filip Ieremievici. By 1876, there were 2,643 Orthodox parishioners in Tereblecea, under the care of Father Dimitrie Seleschi and his priest cooperator Father Ilarion Dracinschi. With the continuing growth of Tereblecea came the need for a newer and larger Orthodox church. 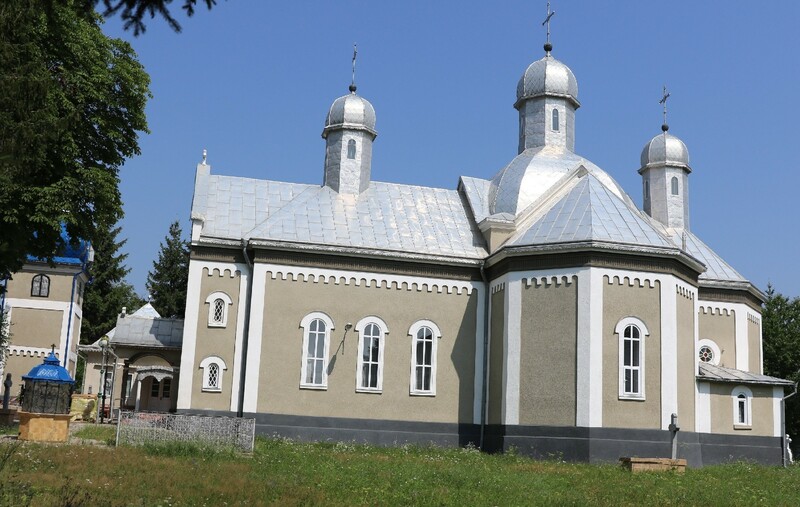 So it was that, as Dragusanul writes, "The Orthodox Church of the Holy Archangels Michael and Gabriel in Tereblecea was built on the site of the ancient churches of the monastery of Putna, under imperial patronage, between the years 1883 and 1886." By the beginning years of the 20th century, the parish pastor in Tereblecea was Father Stefan Seleschi, son of Father Dimitrie Seleschi. Born in 1842, Father Stefan was ordained a priest in 1868. His priest cooperator was Father George Ciupercă, born in 1873, ordained in 1900, and the church cantor since 1888 was Ioan Botezat, born in 1864. The Metropolitan Nektarios Cotlarciuc visited Tereblecea on 26 Sept. 1925 and was greeted by the priest and a large crowd of parishioners accompanied by area government officials. At left is the Church of the Holy Archangels Michael and Gabriel in Tereblecea, and at right is the church's iconostasis. The church was built from 1883 to 1886 on the site of former churches of Putna Monastery. These photographs were taken in July 2016 by Adrian Zotic. According to Dragusanul, during the 1860s one of the Lutheran Germans of Tereblecea, Johan Hubisch, spent 1,100 Dutch guilders to build a Lutheran church in Tereblecea. That church was consecrated on 23 Nov. 1867, but it was destroyed by the invading Russians in 1917 during World War I. After the war, the church was rebuilt in 1920 on the same spot. The first pastor of the Lutherans of Tereblecea was named Rudolf Fischer. Meanwhile, as early as 1873 the Catholic Slovaks of Tereblecea had been worshipping in a chapel at the east end of the village. It wasn't until 1937 that a Catholic church was built in Tereblecea, Dragusanul writes. The first Romanian school in Tereblecea was built in 1816, according to Dragusanul. The building held six grades -- this agrees with our own family's tradition, supported by the U.S. Census, that my grandparents attended school until the sixth grade. It was not until 1874 that the Germans of Tereblecea built their own school, which had only four grades. In 1890, says Dragusanul, "The teachers of the Romanian school were Constantin Botezat and Constantin Corvin, and at the German school, Peter Serfas, Val. Schweitzer, and David Hoffman. The Orthodox parish priests were Ilarion Dracinschi and Vichentie Simiganovschi, and the church cantor was Ioan Botezat." A reading library was established in Tereblecea's Romanian school building in 1896. The library, Dragusanul writes, had "75 members, 112 books, a subscription to one journal, and capital of 5 florins, the founders and leaders of this first municipal library in Tereblecea being Ambrosie Gribovici, Ioan Fedorciuc, and Dimitrie Zaremba." A few years later, in 1900, a rural bank was set up in Tereblecea. "The houses of most of the Romanian farmers were small wooden structures with clay-plastered, whitewashed walls. A house typically had an entry room which also served as a place to store various tools and also one or two rooms with clay floors. One room was used as a kitchen. Broad benches were placed against the walls and these were covered with handmade wool blankets and carpets made with beautiful designs and colors, with sheep pelts, and cushions. The benches were used for seating and for sleeping. The top of the oven, the cuptior, was also used as a place to sleep. "The furniture was limited: in addition to the benches, there was a table and various trunks or chests but rarely a cabinet. "Benches were also placed along the outside walls of the house. The yard was small; the drinking water was brought from the village well. "The houses and business places of the more prosperous farmers and the Greek Orthodox priest were similar in size and furnishing to those of the German settlers, but the lower edge of the shingled roof extended far out beyond the house wall and was supported by narrow beams or rafters. The ridge of the roof was decorated with wood carvings as was the chimney. Each property had its own well. The influence of the German settlers was evident in these establishments. "The few prosperous farmers in Romanian-Tereblestie wore 'German' clothes (haine nemtesti). I have singled out for emphasis the words, "The poorer girls went barefoot in summer," because they brought to mind something my father told me about my grandmother -- she wouldn't wear shoes, and even in winter or cold weather, despite my grandfather's telling her, "Why don't you put some shoes on," still my grandmother would go around the house in bare feet. This habit of my grandmother's would seem to be an indication of her peasant status. The descendants of my grandfather's older brother Mihai Olar have informed me that the old Romanian houses of Prisaca, including the houses where my Romanian grandparents were born and lived, were demolished by the Russian Communist Army around 1940. During World War II, the Russian Communists invaded Romania and occupied northern Bucovina and Basarabia. The Nazis had recently relocated the Germans of Tereblecea to Germany. The Romanians of Tereblecea resisted the Russians, so their homes were destroyed and they were forcibly relocated to the recently vacated homes in Deutsch-Tereblestie. Anyone in northern Bucovina who resisted the inhuman Communist regime, or who were caught attempting to cross the new border into Romania, or who was merely suspected of being unhappy about the daily crimes and atrocities that the Communists committed in the name of freedom and progress, would be arrested, tortured, murdered, or deported to slave labor camps in Kazakhstan and Siberia. The horrors that befell northern Bucovina in general, and Tereblecea in particular, under Russian Communist occupation in those days are recounted in Hell Moved Its Border, the memoir of Dumitru Nimigeanu (Dimitrie Nimigean), which was published in 1960. Nimigeanu was one of those deported to Kazakhstan, later miraculously escaping to freedom in the West. Additional information on Tereblecea is found in Irmgard Hein Ellingson's translated excerpts from Messner's book, at the website of the Bukovina Society of the Americas, here. IN THE United States and Canada, the surname "Olar" is not especially common. Also, some Olar families in North America are not of Romanian descent, but are German, Polish, or Ukrainian -- in those cases, sometimes surnames such as Olarski or Olarovich were shortened to become "Olar," or a surname like Oehler, Ohlier, or Oilier was respelled as "Olar." Among ethnic Romanians in Europe, the Olar surname is not necessarily a common name, but it is also very far from rare. In fact, among ethnic Romanians there are eight variants of the Olar surname: Olar, Olaru, Olari, Olariu, Olarescu, Olaroiu, Olaras, and Olarasu. All eight variants come from an ancient Latin word, ollarius, which means "a potter," a maker of pots (cf. the Portuguese word for potter, oleiro). "Olarescu" signifies "son or descendant of the potter." Olari Church, that is, the Potters' Church, in Curtea de Argeș in Argeș County, located in south central Romania, in the territory of the ancient Romanian principality of Wallachia, is an old Romanian painted church that was built in the 1600s by the local Potters' Guild of Curtea de Argeș. In past centuries the occupation of potter was almost as commonplace as the occupation of smith, so there is no chance of a single genealogical origin of those Romanian families that bear the eight Olar variant surnames. Furthermore, even among Romanians with the surname of "Olar," more often than not they would not be descended from the same ancestral village potter. (For more information, see my Other Romanian Olars page.) Incidentally, my father and his brothers and sisters have said that our surname used to be "Olaru" or "Olariu." In the 1920 U.S. Census, our family name is spelled "Olru," which apparently stands for "Olaru." However, we have found that my grandfather's baptismal certificate spells our surname "Olar," whereas the parish records of Tereblecea spell our surname indiscriminately "Olar," "Olari," and "Olariu." But my grandfather's brothers and cousins appear in immigration records as "Olar," not "Olaru" or "Olariu." "Romanian family names had 'suffered' a process of 'modernization,' and the old forms received a 'u' final. This process was not yet begun when the Romanians from Bukovina emigrated to the New World. That's why most of the Olars living today in Romania call themselves "Olaru." Another example of the same situation: the name of two brothers who immigrated in Montreal before 1914, George and Constantin CASVANEAN. Now, in their native village from Romania all of those from there call themselves CASVANEANU. Casvanean or Casvaneanu means nothing else than 'inhabitant of CASVANA,' which is a village in Bukovina (today in Romania). So a Casvanean from here (Canada) who would like to find his relative there should have to look for CASVANEANU." To learn more about Romanian surnames, I highly recommend the About Names webpage of Romanian genealogical researcher Cosmin Ciocan. Continue reading about the Olar genealogy at Nine Generations of Olars.